Sunday Morning Wake-up Call host Rick Moore talks with 5th District Congressional candidate Leslie Cockburn about her run for the House of Representatives. Topics include: Removing the door of the Congressional office and Medicare for all. Virginia’s 5th District candidate Leslie Cockburn. Making voting more accessible to all Americans. Checking the President’s authority to declare war. Protecting Medicare, Medicaid and Social Security. The power of collective bargaining. Returning to the Paris Accord. The Atlantic coast pipeline and the Union Hill compressor station. Bringing Internet broadband to all of the 5th district. Protecting the rights of women. Financial reform and the national debt. Restoring public trust in government. Protecting the first amendment and the free press. Respecting the Constitution of the United States of America. Removing the door on the congressional office. How to volunteer with the Cockburn campaign. A 94.7 WPVC the special presentation. Leslie Cockburn (D) speaking at the Senior Center in Charlottesville. The program was moderated by Preston Bryant. The 5th Congressional District candidates forum is a biennial SSV event. 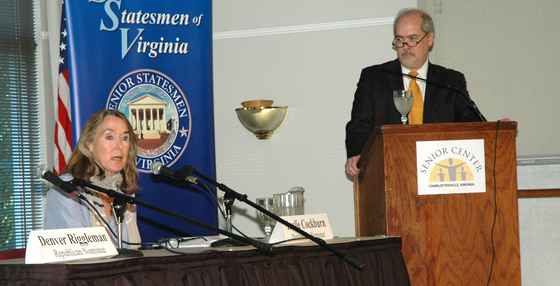 Both major-party nominees, Democrat Leslie Cockburn and Republican Denver Riggleman, were invited to discuss their views. Mr. Riggleman declined the invitation. 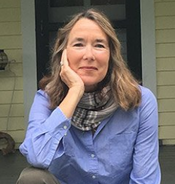 Leslie Cockburn (D), is a graduate of Yale, and has had a 35-year career in journalism, including as a producer for CBS News’ “60 Minutes,” a correspondent for PBS’ “Frontline,” a Ferris Professor of Journalism at Princeton and a writer and author. She has won two Emmys, two George Polk Awards, two Columbia duPont Journalism awards and the Robert F. Kennedy Award. She has covered many of the major developments of our time, from the financial meltdown to the rise of radical jihadists. She has served for many years on the boards of the Piedmont Environmental Council and the conservationist Krebser Fund and has been active in her opposition to the Dominion pipelines and uranium mining. Leslie and her husband Andrew, Washington Editor of Harper’s Magazine, reside on a farm in Rappahannock County. They have two daughters, a son and four grandchildren. Our moderator, Preston Bryant is a senior vice president at McGuireWoods Consulting, where he works in the firm’s infrastructure and economic development group. His experience lies in water, wastewater, and energy generation projects, and he advises clients on project site selection and regulatory affairs. In 2009, President Obama appointed Preston to chair the National Capital Planning Commission, the central planning agency for all federal lands and buildings in Washington, DC, suburban Maryland, and Northern Virginia. At NCPC, he presides over a staff of some 45 planners, architects, engineers and other professionals. The event took place at the Senior Center in Charlottesville. The candidates spoke at the Wednesday August 8, 2018 meeting of the Senior Statesmen of Virginia. The meeting was held at the Senior Center in Charlottesville. Following the presentation questions were taken from the audience. The program was moderated by McGuireWoods Consulting Senior Vice President Preston Bryant. Hosts Jeff Lenert and Bob McAdams talk with Democratic candidate Leslie Cockburn about her run for Virginia’s 5th district. Topics include: Medicare-for-all and the Dominion pipeline. Also, changing police culture. This is our final post in this series. For four weeks in March, WPVC founder and station manager Jeff Lenert and Special Events coordinator Bob McAdams talk to Virginia 5th district candidates about their candidacy. Join him on 94.7 WPVC the Progressive Voice of Charlottesville Saturdays from 11 a.m. to Noon.